For 12,000 years, the indigenous people of our Hawaiian Islands embraced a matriarchal culture that refused the possibility of war. Return Voyage awakens that ancient wisdom–ritual and practices that dissipate anger, prevent violence, foster harmony–and shares its profound implications for the 21st century. For almost two centuries, every Native Hawaiian cultural practice was forbidden – at odds with missionary-imposed laws. The lyrical Hawaiian language was silenced; the masterful healing-arts were prohibited; 12,000 years of sacred ritual was banned – children were legally-mandated to be given Christian names, not Hawaiian. These laws were lifted in 1972, but the damage was done. In their wake, the truth of this remarkable culture was distorted and shrouded from the indigenous people themselves – and, sadly, denied to the rest of the world as well. For thousands of years, this had been a matrilineal culture that empowered and honored women leaders. Nightly, men chanted their celebration of all that was female, in accordance with each moon phase. They acknowledged that they were half their mothers. Ho’oponopono, the sacred, community-centered, mediation ritual at the heart of the Native Hawaiian culture – was created by and fostered through women. In this way, the women diffused impulses that led to hostility. For thousands of years, there was no war. It is the purpose of Huliau - The Return Voyage to awaken the Native Hawaiians to their rightful heritage, and to awaken the rest of the world to the empowering gifts of that culture. Every Native Hawaiian ceremony and ritual began with a chant welcoming the ancestors. ‘Iokepa is a man of deep and proven faith - faith in his people’s birth-knowledge (ike hanau); faith in his ancestors’ wisdom (ke kahiko), faith in his own destiny and purpose. He comes from a culture that celebrates the connections: between people, and between every thread of our natural world. He lives and he speaks with the certainty that his ancient culture holds healing gifts for our warring world. Inette Miller - a Jewish woman, outspoken feminist, successful author, journalist and workshop teacher - surrendered her privileged writer’s life to join ‘Iokepa, camping on Hawaiian beaches with little food and no money – walking the paths of his ancestors. She wrote the story of her overwhelming immersion into the authentic kanaka maoli culture in the book: Grandmothers Whisper: Ancient Voices… Timeless Wisdom… A Modern Love Story. The book won Book of the Year, Visionary Award. 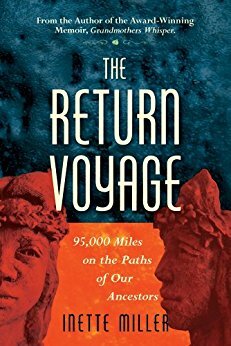 Her next book, The Return Voyage: 95,000 Miles on the Paths of Our Ancestors, continued the journey where the earlier book left off. It has been for Inette, a faith-challenging rite of passage into Native Hawaiian culture. She has embraced it for the love of her husband, her belief in his people, and the certainty that every experience and gift of her own life and culture were the destined preparation for what is asked of her now. Inette Miller was a national and international journalist for sixteen years – a war correspondent for Time magazine in Vietnam and Cambodia. She is the author of the very successful Burning Bridges, produced as an ABC Movie of the Week and translated into a half dozen foreign languages. She has appeared widely on major network news and talk shows – here and abroad. She has taught her powerful Writing to Find Your Voice workshop across the country. She is the recipient of Associated Press awards, Virginia Center for Creative Arts fellowships, and a long-standing member of the Authors Guild. “Who is this man I followed, literally, to the edges of civilization, to the brink of life itself?" Inette Miller is a Jewish woman, a writer, a level-headed single mother agreeing to a rite of passage that demanded she walk naked in someone else’s homeland – trek the blurred borders of magic. She was mute that first year, but she is no longer shy about telling her story. This is the story of the human possibilities of spirit. It is equally the story of the human path, burdened with fears and doubts. She went on vacation for a week, and she stayed for a lifetime. What Does Happily Ever After Look Like? ‘Iokepa is a Native Hawaiian, who relinquished “everything I’d worked for all my life” to embrace his aboriginal identity and reawaken his ancestral culture. Inette is a Jewish woman, who surrendered a privileged writer’s life to join him, camping on Hawaiian beaches with little food and no money, and walking the paths of his ancestors. Together, they packed all they owned into three suitcases and began their ancestor-driven Return Voyage across America. Their message: what Native Hawaiians lived for 12,000 years – ritual practices that prevented war – have profound implications for the 21st century. I am a life-long writer. Words are my clay, my oils, my musical notes. I truly treasure the massage of syllables in the creation of message. For the past twenty years, the form and focus of those words, paragraphs, stories, and books have been directed at awakening a sleeping world to two things: the sacred and profound wisdom within the ancient Native Hawaiian culture - and the horrifying results of colonial occupation (read. the United States) on that culture and those Native people. That has been my sole intention - my only job. But this week I confess to the limit of what my words can say - or even more - do. And never has that limitation been so apparent. This week I encountered the visual artist Daniel Finchum’s newest project, “Bruises in the Garden” - and I am humbled. To Be Jewish in a "Christian" Country. Americans have long-savored the notion that within our nation there is a unbridgeable division between church and state. It is a distinction that allowed me, as a child in a public elementary school, to sit silently while my Christian classmates recited the Lord’s Prayer. In later years the very fact, that Jewish children faced that obvious social pressure to conform, was challenged. No longer were small children forced to disobey their school authority in order to obey a higher power. Our federal courts reminded: school prayer was against the law. My husband is a Native Hawaiian. ‘Iokepa’s words are quoted in this post’s title. He speaks them with a profound sense of grief - and a barely hidden anger. He struggles with those divergent sentiments. He knows that to speak his mind is to court accusations and dismissal as, “Another angry Hawaiian.” And yes, there is a great deal to be angry about. But ‘Iokepa Hanalei ‘Imaikalani knows that ears close when words are daggers. The last twenty-two years of his life have been about crafting words so that ears remain open, and hearts receptive. We’ve all read about the infamous Bernie Madoff who defrauded his near-and-dear of $65 billion - often from the charities he “served.” We are aware of the “Nigerian Prince” scammers who invade our email boxes with promises of great wealth. That happens to others. Not to ‘Iokepa; not to me. We own almost nothing - and yet we have more reasons for gratitude than we can crowd into a day’s prayer. Our work daily delivers chance meeting with amazing strangers; consistently fills us with purpose greater than ourselves. Life is very very good. Murphy Brown Returns: the Same Show, a Different World? The television sitcom, Murphy Brown, starring the smart and outspoken Candice Bergen, returns 20 years later - and I can’t help but reminisce - and laugh in anticipation. Generations of younger folk have no recollection of that first television sitcom - ever - to evoke a knee-jerk (and at that time shockingly, politically incorrect) reaction from the Vice President of the United States of America! Let me remind you - before President Trump, that just did not happen. In those simpler times, when Presidents or Vice Presidents didn’t demean their office with gratuitous critique of television actors, Vice President Dan Quayle stepped into the seeming triviality of a television show, and found out that it was a quagmire. Now We Are Killing Reporters. We are killing reporters in the very newsroom where I too was once a young reporter. I was twenty-two years old, just months out of college and over-filled with ambition, work ethic, and a genuine sense that I could change the world for the better. I suspect that these - now dead - five journalists inside the newsroom that we once shared at the Capital Gazette, embodied the same. Few end their careers at small town newspapers - many begin them there. Those that remain have a passion for the challenges of local news - in other words, for community. When You've Relinquished Everything - What Remains? I've already written the backstory in some detail. What I omitted and plan to address here is the quirkier one - when all material possession had been repeatedly relinquished, what remains? What on this good earth did we value enough to keep? We receive each offering with gratitude. However when your life's physical bounty (by necessity and choice) fits in the trunk of a medium-sized sedan, and your life is determined by continual surrender...well. On the Horizon: A New book. My blog-writing fingers feel rusty. My intense focus in one direction has meant the utter neglect of this other. I don't multi-task at all - not with writing. So stealing energy from this public forum - I've invested it wholehearted in a private (for now) endeavor: a new take on a very old subject - my next book.. Writing projects, like babes in utero, have their moment; they can neither be rushed nor ignored. Ten Years on the Beaches. Ten Years on the Road. What Next? Change is inevitable, whether we welcome it - or vigorously oppose it. 'Iokepa and I have attempted for these past twenty years to actively surrender to those forces. We look for guidance, and try not to let our whims impede the larger purposes. It's not always easy. We're human and the temptation to impose our own will is so very...enticing. I smile as I write those words, because I'm reminded of an acquaintance on our most recent tour saying: "I may not always be right, but I am always certain." We are returning home from the East Coast, to Kaua’i, on March 18, 2019. We expect to continue our work, as usual, throughout the rest of the year on the Hawaiian Islands. For each of the past twelve winters, we have taken our empowering Return Voyage speaking and book tour on the road. Coast to coast, we have shared our stories at clubs, churches, bookstores, universities..
We continue to welcome invitations (on Island or off) to speak to your preferred audience, in your chosen venue, at an agreed upon time. As always, we do not charge for our appearances. We ask now that our individual hosts assume travel responsibilities from our home on Kaua’i. Contact us with your questions. We are the proud, generous, faith-filled people who inhabited these Islands for over 13,000 years. Our aboriginal ancestors were born from the heart of our Creator and set down on these Islands to assume human responsibility for its stewardship. Before colonization, the nation of Lāhui (now Hawai’i) embraced a culture that insisted on the interdependence among and responsibility for every thread of Creation – human and natural. These were a people whose ancestral wisdom guided their every breath; who welcomed strangers with open arms, open hands, and open hearts; who could imagine neither ownership nor greed, gender separation nor warfare. When freed from foreign strictures, they live this still.